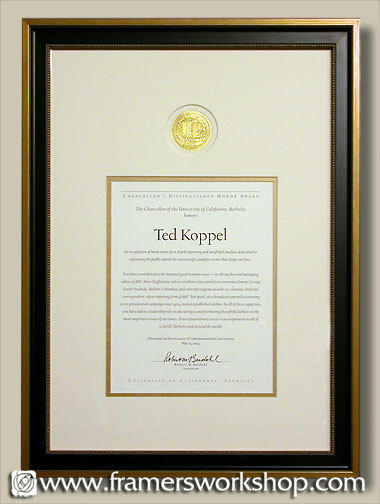 This Chancellors Distinguished Honor Award was framed for the University of California as part of an ongoing project. We framed the award using an ivory Artcare rag board mat with a brushed gold inner mat. We cut a circle opening for the U.C. seal, and framed the piece using ultraviolet protecting glass and a black and gold diploma frame by Larson-Juhl.